Eryn Rae, Radio 2 Folk Award finalist. A young Borders musician has been selected as one of only four nominees in the youth category for this year’s BBC Radio 2 Folk Awards. Talented fiddler Eryn Rae, 16, from Lanton has made the final of the Young Folk Award category, having impressed judges at a workshop and performance weekend last month. From playing at competitions and concerts across the country, both as an individual and as part of various bands, Eryn boasts an extensive traditional repertoire and experiments with a variety of Scottish styles. Taught by renowned Shetland fiddler Catriona MacDonald since the age of seven, Eryn has also been tutored by well-known folk musicians Kathryn Tickell and Ian Stephenson. She has played as far afield as Chicago and Denmark since joining Gateshead-based youth ensemble Folkestra five years ago. Closer to home, Eryn also plays with various different line-ups, including a duo with Borders guitarist Scott Turnbull, and a new seven-piece band, Northern Company, with whom she will be touring this summer. Having already impressed the judges enough to make the final four, Eryn can do no more until the winner is announced in April. She said: “In December I was nominated as two out of 10 semi-finalist acts, performing both as a soloist and with Northern Company. “For the semi-finals, we all went to Kendal for a weekend in January where we were mentored by English folk musicians, Nancy Kerr and James Fagan. 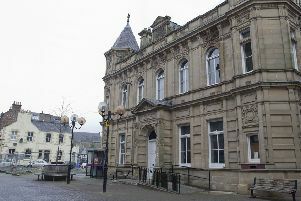 The final concert was held in the Kendal Brewery Arts Centre and each act performed a 10 minute set to the audience, which included the six judges and the four finalists were picked from there. Going forward, the fifth year Jedburgh Grammar School pupil hopes to move to Glasgow for university where, regardless of which subject she chooses to study, she can immerse herself in the music scene there. Eryn will join the other finalists at The Royal Albert Hall on Wednesday, April 5, where the BBC Folk Awards winners will be announced and broadcast live on Radio 2. The prestigious event this year features performances from the likes of Billy Bragg, Afro Celt Sound System and Al Stewart. Eryn is up against three fellow finalists Amelia Coburn and duos Charlie Grey and Joseph Peach and Josie Duncan and Pablo Lafuente.